Mrs. Ephemera and I found ourselves toodling up US 27 in Polk County this weekend and I made a spontaneous decision to drive through downtown Haines City to take a look around. There are some interesting structures in the quiet little downtown that has obviously seen more prosperous times. 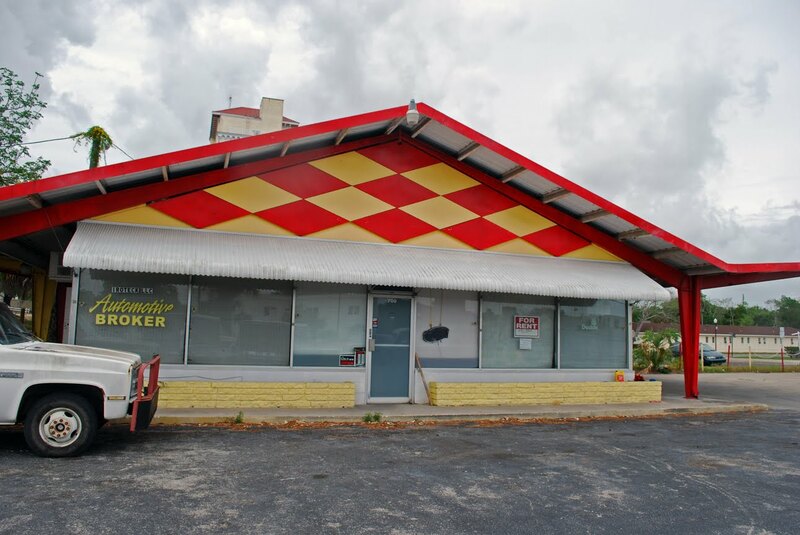 As I drove into town, my eye was immediately drawn to this building, a bright red and yellow mid-century survivor with upswept wings on either side. It's latest use was home for a used car lot, but I suspected it originally was something else. 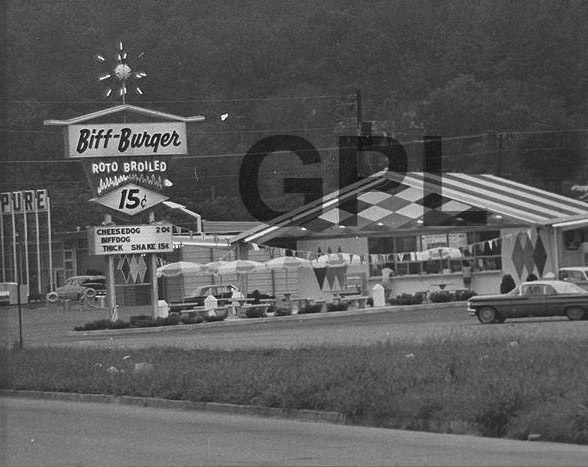 So I dangled the photograph under roadside expert Debra Jane Seltzer's nose and in the blink of an eye she reported that it was a former Biff Burger and supplied a link to her website where I could see other examples of the now defunct fast food chain. 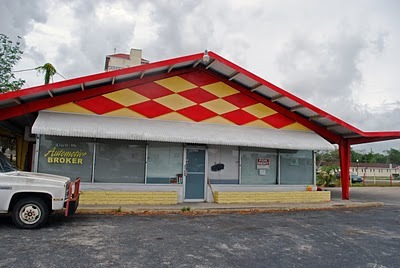 Originating in Clearwater in the 1950s the chain, (Biff stands for Best in Fast Food), grew mostly throughout the southeast until the mid 70s when it suddenly closed. 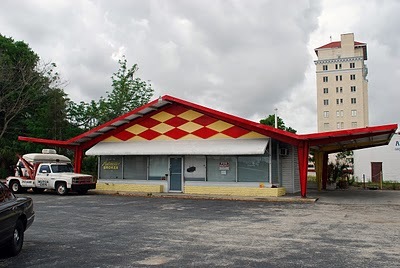 Today the only eatery operating as Biff-Burger is in St. Pete. 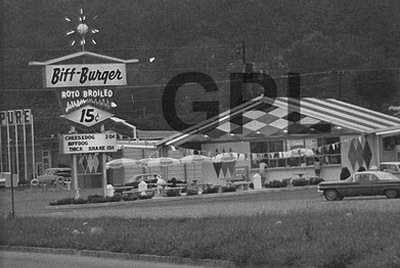 A link from Debra Jane's website to the Biff-Burger website supplies a great history of the now defunct chain including an evolution of its distinctive architecture. Identifying the building a couple hours after photographing it makes me appreciative of the internet and wonder how we got along without it before? Perhaps we had to have more patience and sit down and write letters, make phone calls or actually go to the library to do research. I know experts say that the results of our technological age can lead to greater isolation, but to be able to have a mystery solved, almost instantaneously sure feels satisfying. Personally I feel more connected because of all the online relationships I've made over the internet with people who have similar interests. Folks who live all over the country and get excited about learning about a hamburger chain that closed 35 years ago. 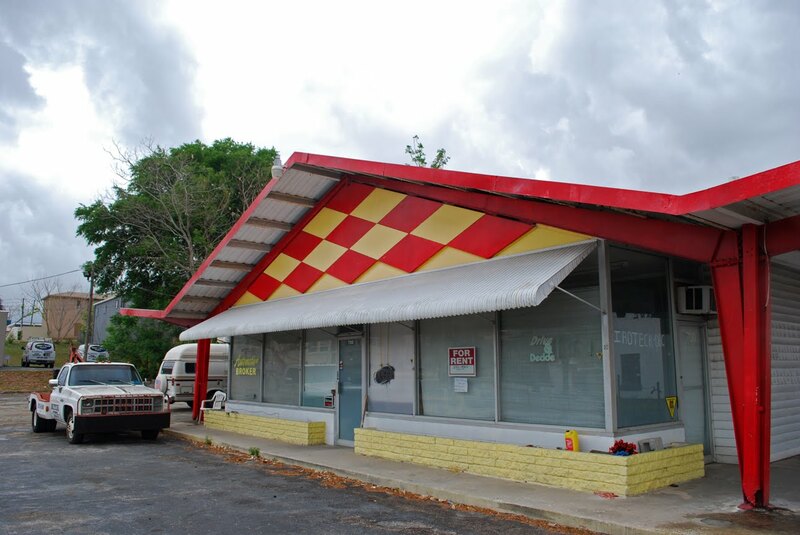 And now I'll be on the lookout for other Biff-Burger locations on my roadside wanderings, and perhaps they will too!